You may have thought that my game show career began relatively recently: but no. Before there was Weakest Link ; before Millionaire ; before BrainTeaser ; a long time before... there was a show called Three Little Words , produced by HTV West in Bristol for the ITV network. The show went out for a few years in the mid-1970s, presented by DJ Don Moss. (It was revived for a while in the ’80s with ventriloquist Ray Alan as host.) Contestants played the game in pairs (friends, husband/wife etc.). One member of each pair would be given a word, and would then have to convey it to their partner using a maximum of three one-word clues. If the partner correctly guessed the word after the first clue, the team gained 20 points. If they needed two clues, they’d score 15; after three clues, the score dropped to 10. If the partner failed to guess the word after three clues, a member of the opposing team could try and guess it for five points. After a set number of rounds, the team with the most points would be declared champions and would play another game against a new pair of challengers, up to a maximum of six games, accumulating prize money as they went. 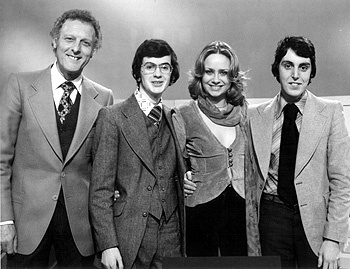 In early 1977, I applied to be on the show along with my school friend Nigel Gillespie. At 16, we were the minimum age allowed by the rules of the programme and, amazingly, we were accepted without audition. We had to get special permission to take two days off school – we’d be staying overnight in Bristol after the recording on March 1 and travelling home the next day. The picture shows Don Moss, me, hostess Linda Hayden, and Nigel. (Linda was an actress renowned for her scantily clad appearances in low-budget British films such as Blood on Satan’s Claw , Confessions of a Window Cleaner and Queen Kong ; her role on Three Little Words , though confined largely to introducing the contestants and announcing the scores, nevertheless did much to boost the show’s popularity with heterosexual male viewers).